Product #5411 | SKU FSG02701 | 0.0 (no ratings yet) Thanks for your rating! Coiled cord for placement of speedlights off camera. 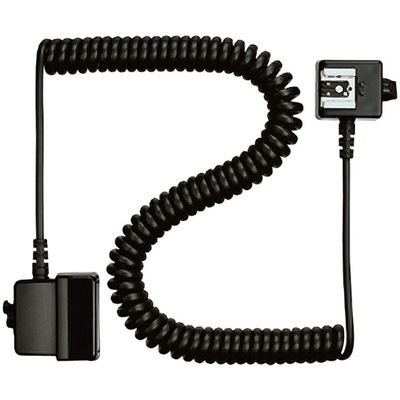 The Nikon SC-29 is an off-camera flash cord that provides full TTL control for Nikon Speedlites when used with Nikon SLR cameras which have the TTL hot flash shoe.It expands to 3 meters long and permits easy use of flash when the camera is mounted upon a bracket. In addition, the SC-29's AF Illuminator will also provide AF assistance to the camera in low-light conditions. This cord fully supports all advanced flash functions when used with the SB-900, SB-800 and SB-600 with an applicable camera. Some other improved features are: Posi-Lock (an improved locking switch) at both ends, and the cord on the camera shoe that now connects parallel to the camera.